Well, it is high time for a good old autonomous Mutant Worm flick, a stop motion even. So here’s Wasted Cowboys! A short Playmobil stop motion. Not really for kids, although they do seem to like it. 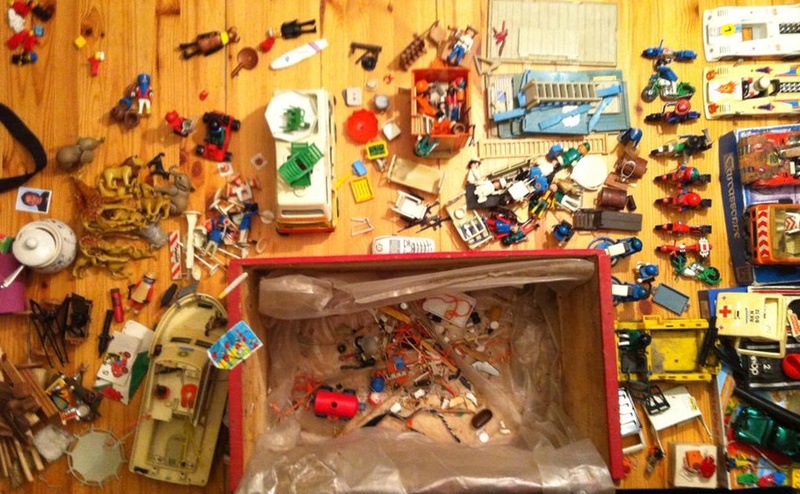 It all started when I got my 70’s-early 80’s Playmobil off the barn attic for my kids. First off, I noticed there was a lot more Playmobil than I remembered, but I quickly realized they were the discarded sets of my childhood friends who outgrew them a bit sooner than me … 30 odd years sooner, it turns out. The boxes were filthy. They’d been collecting dust for decades on the hay and straw attic. 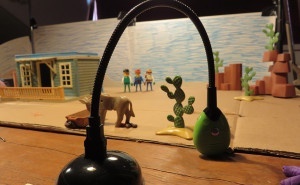 Among the first things I took out was a little cowboy house along with some cowboys, and I decided to do a stop motion test. I’d seen that Hue Animation had software and a HueHD webcam on a goose neck — you know, for kids — so that was going to be my approach: quick and dirty. I also left the Playmobil dirty, which you can notice especially in close ups. I even used my iPhone for the voices and assorted sounds. The way I wanted to do this was quick and dirty but all in-camera for the tactile home-made feel of it — which didn’t work out that way, but more on that later. I’m well aware that stop motion can take a long time. When you’re pressed for time and/or money, the trick is to do as little as possible to come to a cool result. Existing props and characters sure do help. Enter Playmobil. Come to think of it, my first ever film was a Playmobil stop motion. I must have been about eleven when I was at my cousin’s and he and his sister had been playing around with an 8mm camera. As I recall we were in the garden when we filmed his Playmobil; it probably has more hands than Playmobil in the shots. He does have it somewhere so I’ll ask if he can dig it up for me. The story, if you can call it that, sort of happened as it went along. So I had three cowboys, a house, a donkey and a cart. Even some old paper dynamite I cooked up way back when, to add to the play. I wondered what they would be doing if I made a short stop motion. Who were they? What were they like? What were they doing there? Well, I quickly found out. They already looked a bit shabby and as they started talking to one another the tone was quickly set. Kids probably know how this works. I sure as heck didn’t plan it and I tried to tone them down somewhat. They are a loud and rowdy bunch. I think they’re gold-miners. At some point I figured that if I’m ever doing a sequel I’ll have to ask Playmobil to put a gold-mining set on the market. I later found out that they already did. Of course, I’m thinking along the lines of a Temple of Doom sequence so that would get tricky all the same. When I read the early script out really loud to the misses, I got a blank stare in return. Still, I thought … THIS IS GONNA ROCK! Since it took a while — commercial work demanding my attention, you know how it goes — it also grew in the telling. A large influence on, or rather cause of, the psychedelic sequence was my five-year-old boy Tom. I was in our attic/home office figuring technical stuff out, like the camera, software and lighting, when he came along. He stumbled upon my stash of clay and wanted to do an animation. I could only stimulate that, but I wanted to keep it simple, so I figured I’d create a worm out of a bar of clay. But no, he wanted a snail — for obvious reasons. 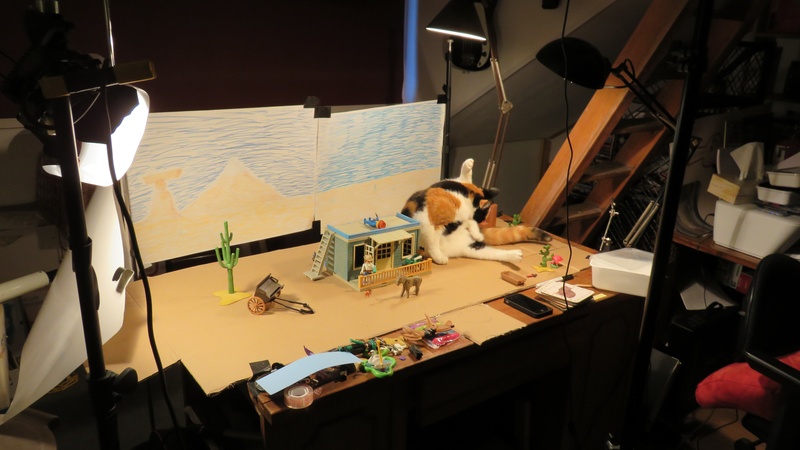 I have to say I was a bit daunted by doing stop motion again. What if I couldn’t do it like I wanted to? What if I failed? So thank you, Tom, for proving me wrong. I think we did the clip below in about half an hour. I intended to just use what I had in the old boxes, but some haphazardly arriving script-elements also made me plunder my girl Zoe’s Playmobil. Also, if you look closely, one of the close up shots of Joshua has a clay cactus in the background. 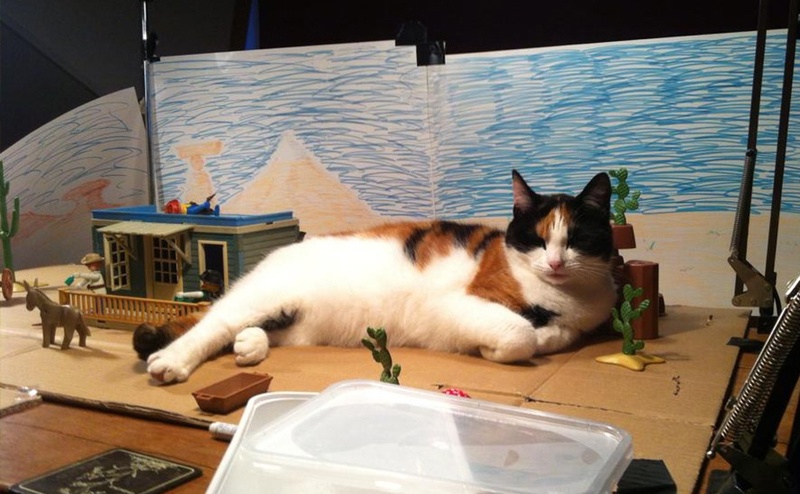 Because it took a while before I could continue, I decided to order some actual Playmobil cacti and mushrooms on Marktplaats (sort of a Dutch Craigslist). Other things could not be done with Playmobil so I turned to clay there. And of course I did a quick and dirty marker drawn background — that was before I knew how it would escalate, although I doubt I would have done it differently. So it grew in the telling, and even without a planned story it’s still pretty round, I conjur. The flying horse is even there at the start. If all else fails, at least it had me in stitches. Did I just say ‘conjur’? It’s amazing no Firefly reference ended up in this animation. Or did I miss it? 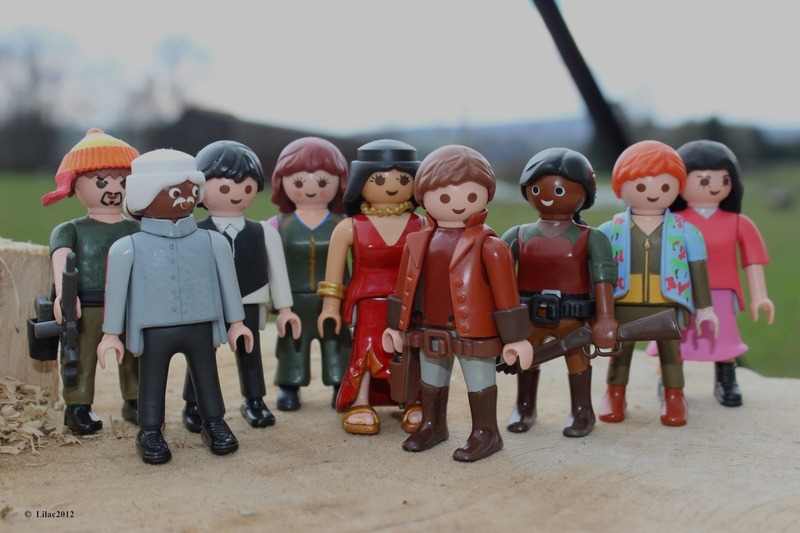 The brain works in mysterious ways … give me a sec … my head just exploded as I decided to google ‘Playmobil Firefly‘. The Hue HD webcam can shoot 1280×720 pixels. 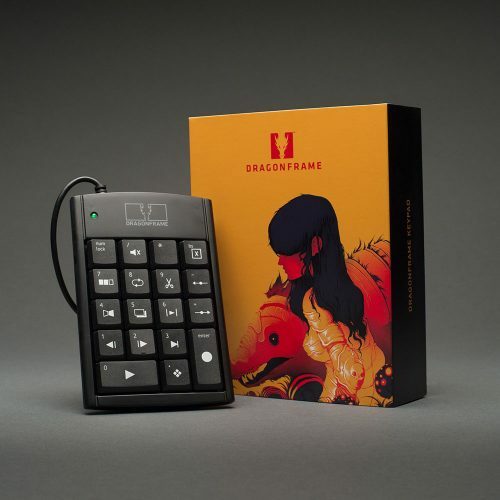 Unfortunately the Hue Animation software could not fully reach that, at least not on Mac, so I turned to my professional Dragonframe software instead. • plus you can actually shift focus during a shot. I used three 100Watt lightbulbs, and as you can see that three point lighting is hardly natural. A friend of mine lend me a LED panel recently so I’m going to try and realize a setup with that next. I couldn’t use it here yet because I’d already shot several sequences and it would have screwed up lighting continuity. I’m saying post, but it was a back and forth. I used Adobe After Effects which is my main tool, also Illustrator for the titles, Adobe Audition for audio editing, and some Premiere Pro. I actually ended up doing sound in After Effects as well, because, well, I’m that kind of guy. I like to tweak with everything there at hand. I should probably do a tutorial about editing in After Effects at some point, for like-minded stubborn lazy fools. So, although I had initially planned to do this all in camera, combining and fixing things in post ended up making this a lot more manageable. For instance, I ended up with several shots having clay rigs to keep things in the air or simply in place: the rocking chair and falling fish. Obvious stuff to use for an animation, but once you get started where do you stop? The rigs had to be painted out so I had the presence of mind to shoot accompanying clean background plates. I also ended up using composites because I didn’t find a way to do the butterflies or flying horse with a glass rig to keep them afloat, and the repetitiveness of the burning fuse called for a separate looping composite done with clay on a black background. Compositing these elements made things quicker, at least this time around. I’d like to do as much as possible in camera but it has to be simple; maybe next time. Mainly you use the tools you need to get the shot that’s in your head. Like the pan down shot at the start. There was no way I could have done that quickly by building a practical sky that high, so it also became something for post. I did some grading using a few masked paper textures, the curves effect and Red Giant’s Magic Bullet Looks. So more and more things got shoved over to post — I felt like Peter Jackson. Where do you stop indeed, and things got more complicated quickly. I even did a facial animation test based on Videocopilot’s Demon Face tutorial. Like I said I used my iPhone 4 for the voices and several sounds, which I ran through Adobe Audition insofar that was necessary. Most of the sound effects I got from my Audioblocks account. Going for quick and dirty I cooked these up by getting some vector elements from Vectorstock, finding some nice cowboy fonts, and a paper texture. Anyways, I hope you liked. I should probably mention the movie references besides Turbo. The ‘Wookie’ remark should be obvious, and Transformers.